For admission to a school, Mr. Yamanaka Takaaki in April 1972. Blade length : 67.2 cm or 26.45 inches. Width at the hamachi : 3.78 cm or 1.48 inches. Width at the kissaki : 2.73 cm or 1.07 inches. Kasane : 0.81cm or 0.31 inches. Shape : It is wide 3.78cm and thick work with Bo-Hi engraved on both sides. 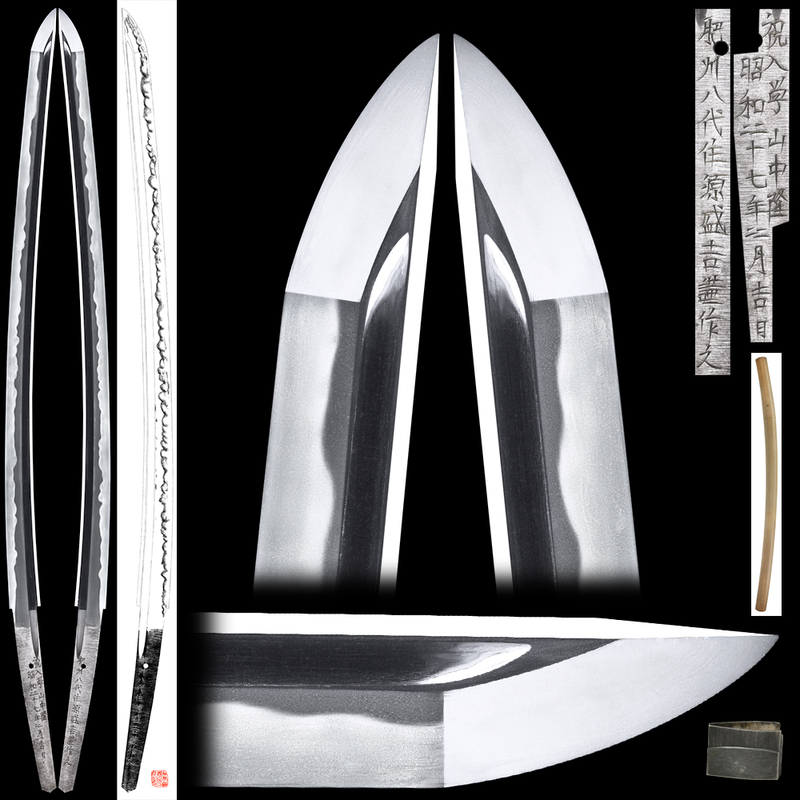 Hamon : Nie deki deep nioiguchi gunome midare with mixture of O-gunome midare. There is sunagashi, kinsuji works appearing in the ha. Boshi is midarekomi with mixture of sunagashi and kinsuji appearing. The Boshi is hakikake style. Special feature : Tanigawa Moriyoshi, born Tanigawa Matsuyoshi at Yatsushiro in Kumamoto pref. and designated as a Mukansa-tosho in 1985. He forged this katana in his last years. His willingness and ability to forge sword did not drop off even in his old age. Whole workmanship shows his unabated vigor. He passed away in 1990, aged 70. This blade is the masterpiece of Morioyoshi's later years. He is good at Sa-Monji and Kiyomaro Utsushi blade. This blade has nice deep Nioikuchi and his greatest work.